The distance from Kalanki to Naxal is roughly six or seven kilometers. During normal non-office hours the distance can easily be covered in less than 25 minutes. Or so I thought. But my calculation went awry when I recently took the route, not realizing how bad our roads really were. By the time I realized my mistake, I was already trapped in a traffic jam, enveloped by a tsunami of dust for 70-long-minutes. Plumes of dust emanated from a road construction site, and I felt helpless, hiding behind the inadequate defenses of my facemask. With every breath I inhaled airborne particles were infiltrating the vehicle, even with the glass windows rolled up. Bikers, cyclists and pedestrians were all stuck. Honking is against traffic rule, but agitated drivers honked in desperation, but to no avail. As night began to fall, streetlights came on, and by this time everything was covered in a thick haze of dust. Those dust-desecrated seventy minutes triggered an allergy, resulting in severe throat infection, smoker’s cough and itching, watery eyes. As desperate as I was, I could not help wonder: How do local residents who live by these dusty roads, especially children, senior citizens and asthma patients, cope with dust from the prolonged road construction? Either they are unaware of pollution risks and threats, or they do not have adequate information related to their health and environmental rights. Children and senior citizens are more vulnerable to environmental pollution, especially when they are not the ones who cause the pollution. This raises a further question: What are the long-term effects of dust pollution? Should the Department of Roads, the Ministry of Health and Population and those directly involved be held to account for not taking precautionary measures to mitigate side-effects of urban reconstruction? More importantly, why don’t members of local community protest if prolonged urban development projects cause inconvenience and adversely affect their health? The Kalanki road I discuss is one example among many. 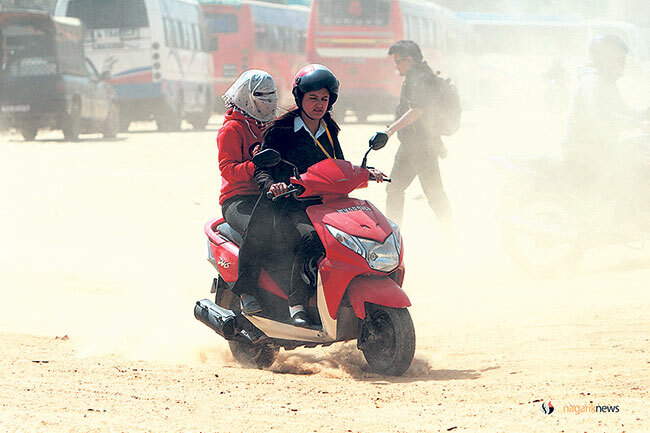 The road expansion project that started four years ago has left many incomplete roads dilapidated, turning Kathmandu into Dustmandu; the dust pollution in turn has accentuated health hazards. While advance in modern medicine has eradicated a number of infectious diseases, manmade environmental hazards have resulted in equally dangerous health risks. A few months ago Numbeo.com published a report that placed Kathmandu fifth in its annual pollution index. But weren’t our planners and policymakers supposed to first inform the public about the health hazards their urban undertakings would invite? Did they even think about it? Or did they hasten construction without any homework? It will be wrong to imply that bad roads are solely responsible for Kathmandu’s air pollution. Poor upkeep of our vehicles, inadequate urban planning and lack of ecological priorities are also to blame. Internal migration has caused unprecedented growth in urban population resulting in higher energy consumption, housing congestion, poor urban planning and perpetual traffic jams. Unregulated brick kilns and factories only add to this pollution. With its population increasing, Kathmandu is fast losing its greenery. Protracted road construction and emission of toxic vehicle pollutants have become harmful to environment in general and to urban dwellers’ health in particular. The human-centered “modernist” promises make us ignore and repress age-old beliefs that place high value on coexistence, inter-dependence, tolerance and mutual respect. In this context it is crucial to understand that native/indigenous personifications of nature, in Nepal as in many other regions of Asia, mean much more than illogical fantasies. Leaving aside the orthodoxy rituals and explanations, the ancient texts of Veda personify nature as human, as Agni, Varun and so on. Similarly, in the philosophy of PanchaMahabhuta, five elements of nature—fire, earth, space, air and water—are thought of as humans. Also, the Buddhist call for compassion for all living beings and the Sufi renunciation of self are some other non-human-centric philosophies that emphasize coexistence between human and nature. While the materialistic modernity, supported by the ubiquitous commodity culture, has become the norm, ecological concerns are more and more ignored. As the insatiable human-centric desire for development grows, pitfalls also loom large. Prospect of immediate materialistic gain is putting our future at risk. Analyzing delayed road extension in relation to local dwellers’ health as well as the ecosystem, I relate to Buddha’s teaching, ehi-passika, which implies that you should learn to see things with the help of your knowledge and not blindly follow faith. As we try to keep up with modern development, without considering underlying environment stressors, not only is the quality of our life affected but our biological ecosystem, on which future generations will depend, will be endangered as well. Urban planning should be pursued such that human living standards improve and the environment protected. A well-planned development project can reduce adverse environmental and social impacts in a city and its periphery, leading to improvement in human health and quality of life. In contrast, poorly planned projects, such as delayed road extension and Melemchi project, contribute to environment degradation, while also making our lives more difficult. The modernist ‘shopping mall’ culture is rooted in our desire to consume more and more. As a result of this growing culture, we have come to accept environment pollution as pretty normal, and as an inevitable side-effect of development. We are so busy solving our everyday problems that we are unmindful of situations that can adversely affect our lives in the long run. Living blithely in escape fantasies and breathing in uncertainty can provide only brief respite. Big roads may reflect big materialistic dreams, but are they really that important, and at what cost do they come? Getting to breathe fresh air is not a privilege but a fundamental right. This is the time to rethink our role of unthinking subjects of a sovereign state. We must learn to speak up before it is too late. The big question today is: Can we have a blueprint of development that encompasses vital human concerns, like their right to live in a clean and secure environment?